Personal-sized cakes are baked in mason jars for the perfect after dinner treat. Want to impress someone special this Valentine's Day? 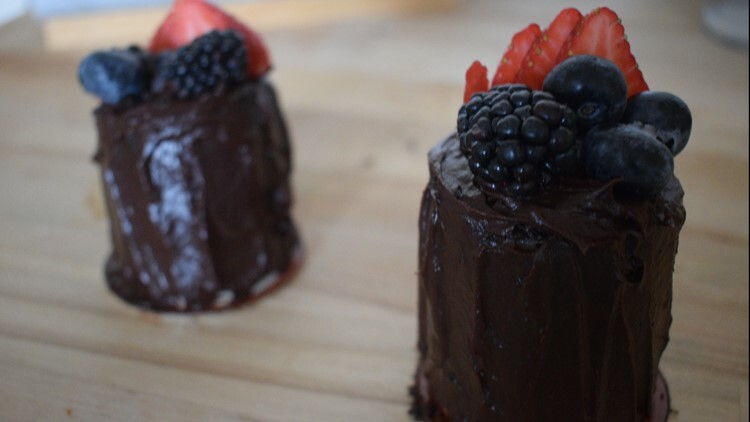 These double chocolate mini cakes are sure to do the trick. The personal-sized desserts are decadently rich and elegant. And you don't need any special baking or decorating skills to make them! Small mason jars shape the cakes perfectly, chocolate ganache is easy to spread and fresh fruit give them a classy, finished look. In a large bowl, mix flour, sugar, cocoa, baking powder, baking soda, salt and espresso. Add coconut milk, vegetable oil, the egg and 1 tsp vanilla. Stir until just combined. Add boiling water and stir until batter is smooth. Pour batter into well-greased 8 oz mason jars. Fill each about 1/3 of the way as they will rise quite a bit while baking. Bake for about 15-20 minutes or until the top of the cake is puffy and firm and a toothpick or knife inserted into the center comes out clean. Let cakes cool. While cooling, making your ganache. Put chocolate chips and cream in a bowl and microwave for about 1 minute. Add butter and remaining 3/4 tsp vanilla and mix again until smooth. Set ganache to the side to slightly set. When cakes are mostly cool, remove them from the jars by running a knife along the edge if needed, then turning the jar upside down and gently tapping the bottom. The cakes should release from the sides of the jar as they cool. Allow cakes to finish cooling completely before frosting. The ganache should now be at an easy spreading consistency. If it's still too runny you can let it sit longer to firm up a bit more. If it's too hard, you can microwave it for about 10 seconds. Spread ganache evenly over the cakes using the back of a spoon or a small spatula. Top each cake with fresh fruit. *If you'd like the ganache to have a fudgier consistency, you can refrigerate the cakes for a little while before serving. Or, serve just after decorating!